Muscular men are constantly objectified in popular culture. Instead of using anabolic steroids to build muscle and improve body image, more men are turning to over-the-counter performance-enhancers, such as whey protein, protein bars, glutamine, L-carnitine, or creatine. In new research recently presented at the American Psychological Association’s 123rd Annual Convention, Dr. Richard Achiro and his colleagues found that the excessive intake of body-building supplements may qualify as an evolving eating disorder in men. The study observed 195 men between the ages of 18 and 65 who had used legal over-the-counter performance-based supplements within the last 30 days. The men had also stated they worked out for appearance or fitness reasons at least twice weekly. They also completed an online survey that included questions about body image, eating habits, gender role conflicts, self-esteem, and supplement use. Researchers found that 22% of study participants had replaced regular meals with supplements that were not meal replacements. Over 40% of participants had increased supplement use over time, 29% were concerned about supplement use and 8% were told by their physician to cut back or stop supplement use due to potential side effects. Three percent were hospitalized from liver or kidney issues linked to supplement use. Study results significantly correlate with previously established indicators relating to eating disorders, such as restrictive eating and concerns about eating patterns. Achiro and his team conclude that a combination of factors seem to drive the misuse of legal supplements for workouts such as gender role conflict, low self-esteem, and body dissatisfaction. The men may also believe they don’t live up to the expectation of masculinity often presented in mainstream pop culture. Achiro, R., “Excessive Workout Supplement Use: An Emerging Eating Disorder in Men?,” American Psychological Association web site, August 6, 2015; http://www.apa.org/news/press/releases/2015/08/eating-disorder.pdf. 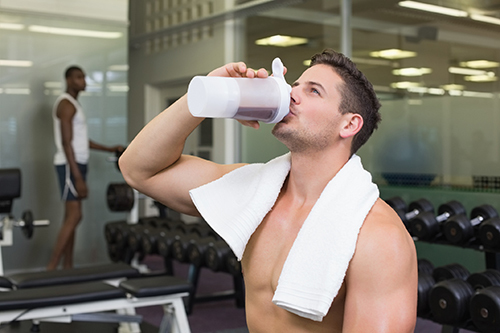 “Excessive Workout Supplement Use: An Emerging Eating Disorder in Men?” American Psychological Association web site, August 6, 2015; http://www.apa.org/news/press/releases/2015/08/eating-disorder.aspx. “Excessive workout supplement use: an emerging eating disorder in men?” ScienceDaily web site, Aug. 6, 2015; http://www.sciencedaily.com/releases/2015/08/150806151504.htm.